On January 21st we will be getting a double treat. Not only will we be having a supermoon, but we will also be having a blood moon which will be a great way to kickstart 2019. A blood moon is what we call the moon that occurs during a total lunar eclipse and a supermoon is a full or new moon that happens when the moon is closest to the earth. These are both interesting phenomena that on occasion can happen at the same time. When they happen at the same time we end up with a Super blood moon which is an interesting concept. Total lunar eclipses are quite neat as during them the moon will appear almost red in color. This is because of the way that Earth’s shadow appears when the moon passes through it. You see light from the sun is hitting the earth but it is being blocked by the shadow of the Earth, what little light does pass through during this time doesn’t look quite the same. Red tends to make it through this shadow much more easily than any other light color. Lunar eclipses can only occur on full moons and only happen when the Sun, Earth, and Moon are all lined up perfectly. Now, while it is called a blood moon the actual coppery tones depend on how much dust there is in the atmosphere. The more that is present the darker red the moon will seem to look. 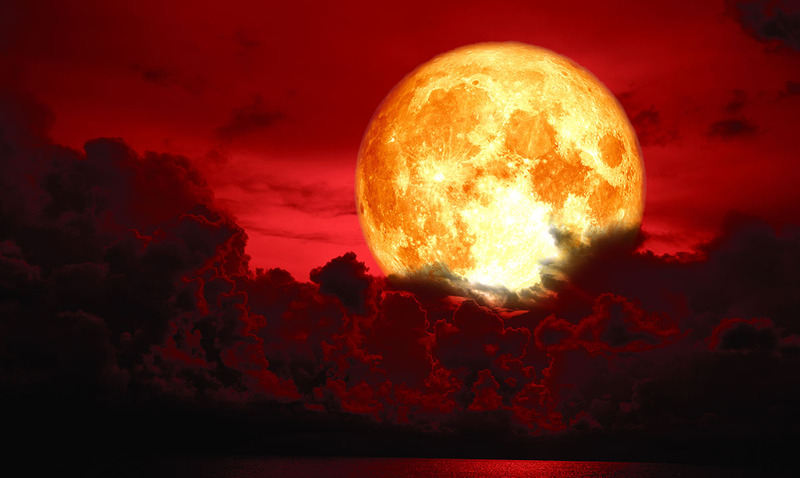 While blood moons, in general, do not occur often we do see them at least once or twice a year so for this one to be partnered with a supermoon is even more-so rare. Now, because this will also be a supermoon the moon itself will be quite huge. The closer it is to us the bigger it appears. When a supermoon happens the moon itself is on the opposite side of the Earth from the Sun and as noted at its closest point. If you live in the US you should be able to see this spectacle just fine as the moon makes its way over North and South America. It is not very common for this kind of thing to happen but we do have them a few times each year. Many people also seem to think that supermoons are much brighter than most other moons but that varies depending on who you’re asking. We have only been using this term for about 40 years so it is still a relatively new concept. While the supermoon to come will not be the closest we have ever had it will be very close. If the moon were to orbit our planet in a perfect circle these interesting celestial events would not be able to occur at all. When the supermoon and blood moon end up occurring on the same day/night we get a super bright and noticeably huge reddish in color full moon. It will have everyone looking up at the pretty figure in the sky. Out of our 87 total lunar eclipses of the 21st century only 28 of them will happen to occur at the same time as a supermoon so you won’t want to miss out on this. You’ll want to stay up late and be patient. The wind-up to the eclipse is long, starting at about 10:36 p.m. Eastern on January 20 when the first hints of the eclipse will start to hit the moon. This is called the penumbral eclipse, and involves a slight darkening of the moon’s surface in preparation for the rest of the total eclipse. The first portion of the partial eclipse phase will begin less than an hour later, at 11:33 p.m. The total eclipse phase will begin at 12:41 a.m. on January 21. The Moon will be in a total eclipse for a little more than an hour, turning an orange-red thanks to the shadow cast by the Earth. It will reach “maximum eclipse” at 1:12 a.m. Eastern before ending at 1:43 a.m. It will then enter another partial phase, lasting until 2:50 a.m. If you’re still up at this point, the last shadows will leave the moon at 3:48 a.m. While it might not be as mind-blowing as some people make it out to be it is a very beautiful sight. If you’ve missed out on the super blood moons of the past maybe you should take a peek at this one on the 21st of January. I for one will be spending a little time watching it myself. To see one of the super blood moons of the past in full effect please take a peek at the video below. The whole ordeal is quite mesmerizing. Things like this should be a great reminder of how marvelous our universe really is.